The panelists of MSNBC’s Morning Joe got a little more than they were bargaining for when they brought Sen. John McCain on their June 13 program. So we're going to be in Iraq and Afghanistan and then we're also going into Syria in your estimate? I mean, I'm just wondering, how long can we do this? How long can we do this? How long can you ask this of American troops and think it's okay? I just want to know. And I know with all due respect, sir, you served and you paid a price. But how long can we do this? Waterworks aside, these liberal hosts would do well to focus less on defending the Obama administration and more on examining the policy implications of American inaction now. There may be no easy call about what level of support the United States gives Iraq, but there are certainly negative implications for U.S. foreign policy if a watching world thinks the U.S. will leave its allies out to dry when the going gets tough in fighting a radical Islamist insurgency. SEN. JOHN MCCAIN: What about the fact that we had it won? What about the fact that people like me said we've got to fire Rumsfeld, we've got to get the surge going. MCCAIN: Yes, we did. Finally. And what about the fact that General Petraeus had the conflict won thanks to the surge and if we had left the residual force behind that we could have, that we would not be facing the crisis we are today. Those are the facts. Those are fundamental facts. Now, I expected you and others to blame it on all these different events. The fact is, we had the conflict won. And we had a stable government. And a residual force such as we have left behind, we even have forces in Bosnia, Korea, Germany, Japan where we could have. But the president wanted out. And now we are paying a very heavy price and I predicted it in 2011. You can go back and look at the quotes. BRZEZINSKI: Sam Stein, jump in. SAM STEIN: Yeah. I just want to nail down what it means to have it won, I guess. Because when we were discussing the war, debating the war, I thought the idea was that we would put up an Iraqi government that could be self-sufficient with an Iraqi military that could carry operations. We spent $25 billion propping up that military. And it folds, even despite having much greater numbers than ISIS. So I'm curious, what is the definition of victory? What is the definition of winning? Does it mean having a residual force basically without end date? I'm just a little bit confused. I want to know what victory is to you, Senator McCain. MCCAIN: I think you are confused because you didn't know what happened with the surge where we basically had the country pacified. We had a stable government in Baghdad. And we had the conflict basically, for all intents and purposes, won. We still got troops in Bosnia. A residual force would have stabilized the country. Most military experts will tell you that. So I'm sorry about your confusion, but the facts on the ground were that Al Qaeda had been defeated almost completely and with the residual American force and at that time, a strong Iraq. Now, Maliki is very weak. And Maliki got worse after we left. And again, I knew this was going to happen. Because we didn't leave that force behind. And so I'm sorry about your confusion, but anybody who was there will tell you we had the conflict won. STEIN: I guess I shouldn't call myself confused because it would be used against me. Um again, though, what is the end date for our forces in Iraq? Is it open ended? If that's the case, because we need to have a residual force there in order to prop up the Iraq government indefinitely. Is that how you see it? MCCAIN: You know, I see that about Japan after World War II. I see that about Germany. I see that about the 38,000 troops we have in Korea. I say that about the troops we left behind in Bosnia. None of them are in danger. These people would not have been in danger either. Because we would have had a stable situation. So you ignore history of what we've done after conflicts which is to leave a stabilizing force behind. Which is what we could have done in Iraq and avoided this debacle that we are in today. And again -- go ahead. BRZEZINSKI: Big picture, Senator. Let me check off some, some boxes here and you correct me if I'm wrong. You would have us in Iraq with a stabilizing force that could somehow prevent what's happening there which is a complete meltdown. Afghanistan. 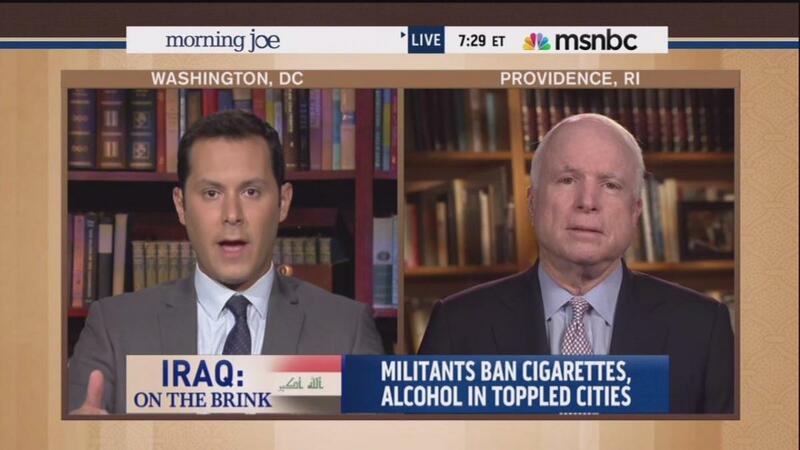 BRZEZINSKI: And we would be well into Syria right now as well. Correct? MCCAIN: Oh, Afghanistan? You're going to see the same thing happen in Afghanistan if we don't leave a residual force behind there. 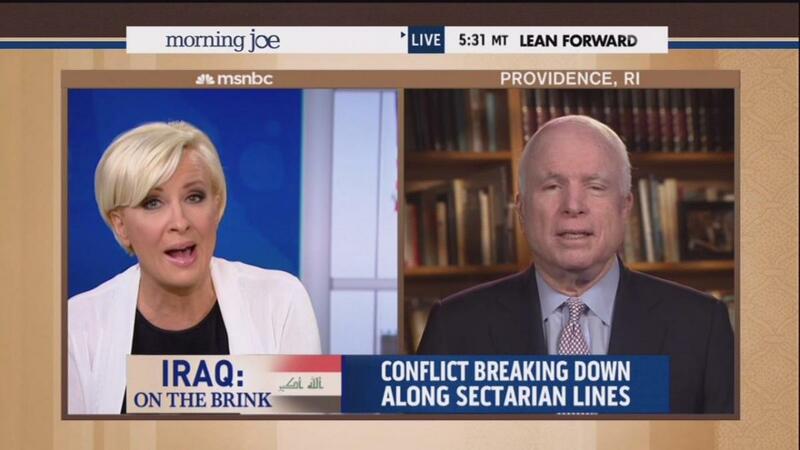 BRZEZINSKI: So we're going to be in Iraq and Afghanistan and then we're also going into Syria in your estimate? I mean, I'm just wondering, how long can we do this? How long can we do this? How long can you ask this of American troops and think it's okay? I just want to know. And I know with all due respect, sir, you served and you paid a price. But how long can we do this? MCCAIN: With all due respect, do you think we ought to pull our troops out of Korea? With all due respect, do you think we ought to pull our troops out of Bosnia? We made great sacrifice in order to stabilize the situation. And now by pulling out we are leaving a vacuum. And all of those sacrifices will have been made in vain. And so I'm not saying that American troops would be in danger. They would not, in a stable situation, which was with the case in Iraq after the surge succeeded. And could be the case in Afghanistan as well. We're not talking about combat. We're talking about residual forces to keep a nation stable. And the American people would support such a thing if it were explained to them. But I can tell you the consequences of a complete pull out of Afghanistan. They will be the same consequences that happened in Iraq. I guarantee it. Just as I guaranteed what would happen in Iraq.